This week’s article is on the problems many families experience with NHS Continuing Healthcare. I recently received one of the saddest messages I’ve read since setting up Care To Be Different. It was from a gentleman in his 80s who was struggling to cope. He was in poor health and was being pushed from pillar to post by people within the health and social care system. He reported being on the receiving end of lies, bullying and coercion. What made his message particularly heart-rending was that it was not about his own care but about his wife’s, who was dying. No one had even mentioned to him that his wife should be assessed for NHS Continuing Healthcare funding or indeed that she should probably be Fast Tracked through the assessment process. Over the years since setting up Care To Be Different, I’ve had direct contact with around 1,500 families, most of whom have been battling with NHS Continuing Healthcare assessments and appeals in some way. I’ve been in their shoes and I know how hard it can be. The more I read about what still goes on in care funding assessments the more I feel moved to write about it. However, many families find themselves going through a lengthy, harrowing and adversarial assessment process to obtain the full funding their relatives are entitled to. Many also feel shocked and betrayed at the tactics used against them. Even just a quick glance at the comments from families on the Care To Be Different website and on other blogs and forums makes this very clear. This also often comes at a time when the family is already in emotional anguish because someone they love is deteriorating. Many express the palpable anger and despair they feel at the hands of a care system that often seems to care very little. Back in 2014 we conducted an online survey asking for feedback on families’ experiences of NHS Continuing Healthcare. The results showed a range of errors and maladministration in the funding assessment process. Since then things have not improved. Indeed, since the (then) government introduced the NHS reforms in 2013, families report that things have got harder when trying to access NHS care funding. Back in 2007, new national guidelines for NHS Continuing Healthcare (the ‘National Framework’) were introduced in an attempt end the postcode lottery in NHS care funding across England. Prior to this, every Primary Care Trust (as they were then) set its own criteria for funding. The National Framework sets out assessment guidelines and eligibility criteria for all health authorities in England to follow. Today’s Clinical Commissioning Groups also have to follow them, as well as (more importantly) acting within the law, including case law like the Coughlan case. Needless to say, the National Framework has done nothing to remedy the problem – and some also question the Framework’s legality. It’s also clear that families in some parts of the country experience worse problems than others. Forums and blogs about NHS Continuing Healthcare, including Care To Be Different’s blog, are full of painful stories that families have shared – accounts of what has happened to them at the hands of some funding assessors. These families do not know each other, and yet almost all report some kind of maladministration and a failure by assessors to follow procedure and/or to correctly interpret eligibility criteria. Assessors may, of course, have been thrown in at the deep end with no training and no knowledge of the legal context of their work. Families report that some assessors have even admitted they haven’t actually read the Continuing Healthcare National Framework guidelines. Families also report being told untruths about the process and about the eligibility criteria; families are excluded when they should be fully involved; documents get altered or go missing after meetings (these are all things families have reported); care needs are played down and marginalised; some families experience verbal threats and intimidation; statements of positive eligibility are later denied; and the list goes on… and on. It was by accident that I first heard about NHS Continuing Healthcare. It happens to many families that way. Over the years I’ve applied for NHS Continuing Healthcare funding on behalf of three of my relatives, two of whom were my parents. They were both in a care home for over four years before they died. I was their power of attorney and, perhaps like you, I didn’t really know how the care system worked when they first needed care. I believed that they’d have to pay for their care purely because they had savings and a house. That’s what their social worker told me; that’s what I’d read in the press; and that’s even what professional advisers had told me. I had no reason to believe otherwise. It came as a shock, therefore, to realise that I was acting incorrectly in using their funds to pay for their care. I discovered this while watching a TV programme about care fees and the Coughlan case. (Pamela Coughlan’s NHS Continuing Healthcare case went to the Court of Appeal in 1999 and she won.) I’d never heard of Continuing Healthcare or the Coughlan case before then. The programme made me realise that my mother, certainly, had care needs way beyond those in the Coughlan case and that she shouldn’t be paying anything for her care. The NHS should be paying instead. And so began a horrendous four-year battle to secure NHS Continuing Healthcare funding for both my parents. It was 10 years ago when I began all this, and I knew of no online forums on the subject back then, and I didn’t know anyone else going through it. The major health charities seemed to know next to nothing, and there were few solicitors who specialised in this. It meant I found myself going through it pretty much alone. I started researching it obsessively, and decided I was unwilling to accept anything less than a positive outcome. Four long years later, and with many tears of frustration, anger and despair in between, I finally succeeded. Both of my parents subsequently received a retrospective refund of care fees plus ongoing funding until they died. This NHS Continuing Healthcare scandal (and scandal really isn’t a strong enough word for it) is covered in the press from time to time, which is good to see. Unfortunately it is then often obscured by the bigger debate about care in general. What makes it worse is that most people don’t realise that most news articles, discussions, radio and TV phone-ins and published information about care fees are about social care. Most people still believe that if they have savings or a house, they always have to pay for care – and yet this is not necessarily the case at all. 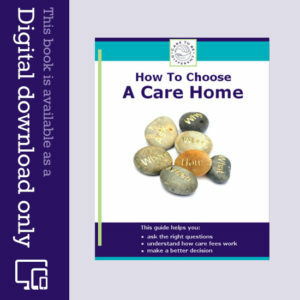 Social care is completely different to healthcare/nursing care. It is only social care that is means tested, and yet this distinction is rarely emphasised. 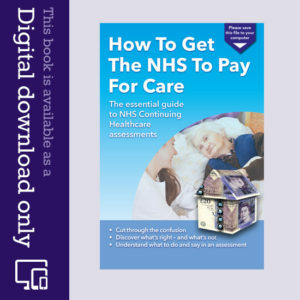 A person with predominantly health and nursing care needs may not have to pay a penny for their care, because the NHS may have a legal duty to pay in full. This hasn’t changed or been affected by any recent reforms, nor with the introduction of the Care Act. Indeed, local authorities have a duty to ensure that people with such needs are NOT channelled into paying for their care. The local authority must alert the NHS about the potential need for NHS Continuing Healthcare funding instead. Many families are never even told about NHS Continuing Healthcare, just like the elderly gentleman I mentioned earlier, who contacted me about his wife. In addition, many families are wrongly told that NHS funding doesn’t apply to their relative – even before an assessment has even been carried out. Is Continuing Healthcare worth the battle? Despite all the hurdles put in people’s way, every week I hear from families who have succeeded and I am delighted for them – that they persevered, that they were able to use the information available to help them, for example on our website, in our Continuing Healthcare book, How To Get The NHS To Pay For Care, and on other blogs and forums. I’m delighted that they were able to hold the NHS to account, and that their relative will now receive the funding they need. It doesn’t mean there may not be further battles ahead, but for now they can take a breather, know that they were right – and that they had right on their side – all along. I also hear from people who have secured the funding after a relatively straightforward process – and it’s always heartening to hear when the process works as it should. Others of course may not receive the funding at all, and that can be bitterly disappointing. It could be for many reasons, including obstruction in the assessment process. It could, though, also be because the person in care simply wasn’t eligible at this point – but that doesn’t mean they may not be eligible in the future. Persistence, stamina and gritty determination count for a lot in this. It shouldn’t be that way, of course, but it often is, and so if you have the energy I would encourage you to keep going if you can. The more you read, the more likely it is that you will know more than the assessors, and it is then much easier for you to pick up on any mistakes made. Make sure you’ve read the guidelines. There’s no way round that if you want to be able to argue your case and pick up on potential maladministration in the process. My own personal experience taught me very quickly that if I was going to win, it was going to be up to me. I had to make the assessments happen; I had to be the one that made sure the people and evidence that should be there was there; it seemed to be up to me to check the right questions were asked in the meetings and that assessors took account of all care needs. I felt at times as though I was almost doing the assessors’ job for them. It’s vital to be as well-informed as you can be, to go into assessment meetings looking and sounding like you mean business and to stand your ground in Continuing Healthcare assessments. It’s easy to say – and yet I know from my own experience how important it is. One of the hardest things about this whole thing is that you can’t necessarily see an end in sight and you don’t know how long it’s going to take. However, the end of the battle could be just around the corner. If you’ve come this far and you are able to keep going, I would urge you to do so. Go into every assessment and review meeting believing you can do it – and that you can succeed. Make the most of the internet and social media (for example, our Facebook page). There is more online about Continuing Healthcare now than ever before. No matter how lonely it may feel fighting for the funding, remember that there are many, many other people going through the same thing – right now – who probably feel the same as you do. Share your experience online, ask questions, offer tips and insights to others, read what others have done. Those people are on your side, and it can help to connect with them online. The process can sometimes take a heavy toll financially and emotionally – and in terms of your energy and your health. Stay aware of how it’s affecting you. be careful not to let the time you spend on all this take you away from the person you’re fighting for. NHS Continuing Healthcare can save your relative losing all their personal assets – everything they’ve worked for during their life. At the same time, make sure you’ve taken a view as to whether you believe they will actually be eligible. Also, keep notes on everything – however pedantic that may seem. And when you know you’re right, don’t take no for an answer and don’t be fobbed off. Read these NHS Continuing Healthcare FAQs – these are some are the most common questions families ask about Continuing Healthcare. If you’ve been through a Continuing Healthcare battle yourself, what strategies did you use to keep going? Hello my mum has had continuing health care for the last three years unfortunately last year she fell and broke her hip since then she has lost her mobility and is no longer a threat to staff and patents we have been told she is being reviewed in a couple of weeks and won’t get the funding again since she is no longer a threat is this right? We feel as a family her care needs are greater now than when she went into the home. Any advice? I also requested a list of documentation used. When the list was sent there was a request for payment with it which was because it was a different ‘records’ department rather than CCG. However, when I checked through the list most of the documents mentioned were ones that I had provided or already had copies of. Also if you are her representative you should have been given a copy of the Decision Support Tool, and indeed invited to attend the review. It is worth looking carefully at that first to see whether you agree with the levels in each domain. Sarah, are you asking the CHC people for whatever was used and created by the MDT at the assessment? Or are you after the persons entire GP records, hospital records, and/or alternative treatment facility records? If is is any of the latter then they can charge for them. If you are representing someone then it is reasonable to pay with their money. If it is the former, the CHC should provide DST copies, panel decision notes and an indication of the records they used to establish their decision. PS….. If they have taken 7 months to respond then they are already in breach of the data protection act. As Chris says, you shouldn’t be charged for any Continuing Healthcare assessment paperwork. For other records, e.g. medical records, there may be a charge and this may help: http://www.nhs.uk/chq/Pages/2635.aspx?CategoryID=68&SubCategoryID=160 Also, see the responses to your question on our Facebook page. I have been fighting my local CCG for three and a half years and have just lost a local NHS appeal that I was forbidden to go to to represent my mother. It’s a disgrace. I now have to go through another sham of an appeal at national level. Then I may finally get a result woth the ombudsman. I have ro sat that I and my helpers have beaten our county council into a corner because as all should know social workers should attend all Decision Support Tool (DST) meetings to put up a robust defence of their budget. Yet we have an e mail from the county councils legal representative saying that they have attended in 75% of DST meetings. I’ve asked what about the other 25% that yu have failed and guess what ? No answer yet again. Our county council are as bad as our CCG to deal with. Things are bad down here in the west. It’s a disgrace. How can you fight someone who completely denies being wrong. I played a video of Pamela coughlan at mums last DST to the CCG operatives and social worker and you could see that they were awkward about seeing that. We don’t think that ANYONE has won CHC funding here for years and it is a loaded system. Ivor – have a look at these Continuing Healthcare statistics by area: http://content.digital.nhs.uk/catalogue/PUB20890 Once you’ve clicked this link, scroll down to ‘Resources’ and then click the second link in that section. D – prepare for the appeal in the same way you would if you were putting your case initially. Pick apart any documentation you’ve received from the NHS and highlight all flaws, omissions, inaccuracies, errors and misleading statement. Use the articles on this website to help you. Be sure you’ve read the National Framework and the eligibility criteria in the Decision Support Tool. And be prepared to argue the scores you should have been given in each assessed ‘domain’. Thanks to you both Angela & Cindy for the very good advice that you have given, we will make sure we are fully prepared for the next meeting and will leave mum’s money where it belongs. Carol – be very, very careful and take good (and independent) financial and legal advice before you do anything with your mother’s house for your own and your sister’s benefit. There are many pitfalls. The three-month CHC review should look at the same things as in the full multidisciplinary team (MDT) assessment (and the previous Decision Support Tool (DST) should be reviewed. Unless it’s shown clearly that your mother’s needs have reduced – AND reduced to below the level of CHC eligibility – then CHC funding should remain firmly in place. Be vigilant – many families are finding that assessors are withdrawing funding at this stage almost as routine. Make sure you’re involved and that you contribute your view. You should be invited to the review and be asked to input. Thank you all for your replies, one other thing if anyone can give advice or share their experiences on this. Our Mother has been granted CHC funding and a three month review is imminent and we wondered what this entailed and who should be present at this meeting. I was informed that my Mothers care needs have not changed and are to date the same as when CHC was granted, this said we are hoping that the funding will continue, again many thanks to all for all your help and support. We put our mum’s house as a ‘gift in trust’ [legally through the solicitor] This means that it is shared ownership between my brother and I, but it is Mum’s house [and the income from the rental] for tax purposes and also from the perspective of not selling it to pay her care costs. However, we had done this when we did the Power of Attorney, several years prior to her needing to go into care and her capital reduced so that Social Services funding was becoming necessary. I think there is a time statute of at least 7 years. Also if there is a close relative or spouse living at the house I don’t think it can be sold to meet care costs. I’m presuming that you &/ your sisters have Lasting Power of Attorney ( at least the Property & Financial one) for your Mother. By law, Attorneys are liable to prosecution if they use the donors (your Mother) assets to benefit themselves. I don’t think what you are proposing to do is legal. It may be a good idea to call The Office of the Public Guardian (Telephone: 0300 456 0300) to get the proper advice. Thank you for your reply Elizabeth, we are thinking along the lines of making sure that enough money is put to one side to cover her care costs for a number of years but are thinking of using the excess balance. Obviously we would not be trying to Deprive her of her Assets as we know the money would have to be covered if necessary. I would like to know if other people have done this. We have recently been granted CHC Funding for my mother who is currently in a nursing home and bed ridden and has also been diagnosed with Dementia. Just recently my mothers condition has improved slightly. My mothers wishes were always that the home that she owned when sold was to be of benefit to my sisters and I. This said the apartment is currently being sold with currently no hope of my mother coming out of the Nursing Home. This is our dilemma what should we do and what can we legally do. We have been told that the CHC carry out a 3 month review. (The funding was only granted on this occasion due to the fight we had in proving that my mother was eligible, after 2 checklists were completed as the first one was found to be wrong.) If my sisters and I share in my mothers estate now can if after the 3 month review and funding is withdrawn how do we stand. My understanding is that if it is granted then it is granted. If we dispose of her estate within this 3 month period where do we stand. As far as I am aware, If your Mother owns the house (or apartment), then until your Mother actually dies, the estate belongs to her, as do all her other belongings. Even if your Mum has signed the property over to you and your sisters, you may fall foul of “Deprivation of Assets”. When CHC is reviewed it can be withdrawn; decreased or increased. Thanks for your kind words, Kathy. Restitution of fees can take time. Make sure they pay interest right up to the date the refund is paid. I also insisted they paid the interest and charges for taking funds from ISA which had been needed to pay fees. I had to submit invoices and bank statements for them to verify payments. I feel at a disadvantage already!! Jeaan, This is one of the more reasonable aspects of the process. Some domains seem unlikely to engender a ‘Priority’ or a ‘Severe’ level of need. I do take your point though. Jeaan – the scores in each domain (i.e. the ticks in the boxes) should have been discussed and written down during the MDT (full assessment) meeting, with your input and involvement. Thanks very much for your comments, Cindy and Elizabeth. I had claimed attendance allowance for mum when she lost CHC funding. When I finally won my case and restitution payment was agreed I contacted DWP and informed them. The AA was then stopped. However they did not ask for the payments already made to be returned. Nb I checked several times to be sure.! This is a great site, thanks. I’ve been pursuing a retrospective claim for my dad for about five years now. The commissioning unit has said they will agree to some of the claim and as you’d expect I’m appealing the time period they’re refusing it. For the part they’ve agreed CHC my dad claimed Attendance Allowance (as at the time he didn’t have CHC). Do I need to tell DWP about the retrospective CHC and pay back the Attendance Allowance? (If he had CHC at the time he wouldn’t get Attendance Allowance). Any help is appreciated. C – DWP will probably contact your dad (or you as his representative) themselves. If they don’t, though, it’s probably a good idea to let them know. You’re correct that if a person receives CHC then they don’t receive Attendance Allowance. The question of the quantum of the refund of privately paid care home fees after retrospective continuing care funding has been awarded has been considered at length. This arose after complaints to the Parliamentary and Health Service Ombudsman. In essence her report finds that the system was a shambles (postcode lottery), poorly resourced and failed to address the loss to the claimants. What followed was firm guidance from the Dept of Health (DH) to the NHS (yes they are two separate entities) and national agreement between the DWP and DH. The ombudsman concluded that in general the NHS should pay interest (the NHS have issued policy guidance to say use RPI) which is much less than the statutory interest on over due debts (currently Bank of England base rate plus 8%). The reason the Ombudsman recommended this was because payees would also typically have been in receipt of DWP social security benefits which they were allowed to keep. Overall the Ombudsman felt this gave fair restitution. This does not prevent a claimant bringing a claim for more exceptional loss but they would have to show a strong causal link between their loss and the NHS maladministration. Report title “Parliamentary and Health Service Ombudsman: Retrospective continuing care funding and redress” published March 2007 avialable online and from HMSO. Note: if your relative is receiving Continuing Healthcare funding at home, there may be instances where they can still claim Attendance Allowance – so always check this. I have read with interest all your comments. My husband has just been awarded continuing healthcare funding for three months and then they are going to review it again – this seems ridiculous to me. I took my solicitor with me to the assessments and she tells me not to worry but I still do. Has this happened to anyone? I think it happened the first time Mum was awarded CHC but then became annual after that. Good luck – meanwhile make sure you keep a record/diary of everything and all contacts you deal with, even minor concerns can add up so that you have continuing evidence for the review. Hi. Yes it is normal to review at 3 months. Keep the nursing home on the ball with records and keep your own diary too. List almost any concern in case the home fails to. Yes, a three-month review is normal – but be vigilant, as you may find the assessors are looking for opportunities to take the funding away. I’m not saying that to worry you – it’s just feedback we have from other families. It is only if care needs have genuinely reduced – AND reduced to such an extent that they are primarily social care needs – that there should be any talk of removing the funding. Hi, my dad was awarded CHC and they never reviewed it in 12 months despite telling me they would every three months. Obvioulsy I never chased them! Hope this helps. My Dad has been diagnosed with Lewy Body Dementia and has been in hospital for 10 weeks in an awful ward which is distressing him and us very much. We’re desperate to get him out of there but the care home we want to get him into is full. To explain, there are only four CHC-funded EMI nursing homes in the county, and we have been warned off the other three (we’ve seen them and we really don’t like them… frankly we don’t want to have to compromise and go somewhere ‘second rate’ just because it’s CHC-approved and has spaces). His best interest assessment suggested very strongly that he should be approved for CHC funding however the panel has requested further information which has caused yet more delays. In the interim we’ve found a care home that does not currently have a CHC contract but that has EMI nursing and beds available. We desperately want him out of hospital as soon as is humanly possible so we intend to get him into the “non-CHC home” which we would self fund while we wait for beds to become available in the “CHC home” (i.e. our first choice). We’ve been warned by the Health Board’s complex care team however that if he DOESN’T go into a CHC home as soon as he’s approved, it could be implied that we’re objecting CHC funding if we insist on waiting for the CHC home that we want for him. I realize that you have more ‘power’ whilst you’re bed blocking but we’re at the end of our tether with this – he’s been in hospital for over 10 weeks now. Can anyone confirm that it’s OK for him to be in a non-CHC home whilst we wait for a particular CHC home to become available? By all accounts he would be a top priority for a place in the home in question and there are no others on the waiting list who have been approved for CHC funding. I’d very much appreciate your advice and can’t thank you enough for the valuable content of this site. Thanks for your comment, Emily. You mentioned that a best interests assessment recommended CHC funding. Was this definitely a best interests assessment? It’s the CHC assessment process (at the CHC multidisciplinary team meeting) that recommends CHC, not a best interests meeting. If you are turned down for CHC, you can argue that the correct process hasn’t been followed. Also, ask the manager at the care home you’ve found whether they have – or have had – residents with CHC funding. If they have, the NHS can’t really object. The key thing in all this is that your dad is somewhere with the appropriate care. Just because there may not be anywhere on the NHS ‘list’ (whatever that may be) does not mean your dad should have to pay for his care. If he’s eligible for CHC, he should be fully funded regardless. I am waiting for the system to assess my mum again she has been turned down twice, she has been self funding for about 5 years and I feel that she has been passed over because of this, mum is 88 she has dementia she has osteoporosis, high blood pressure, thyroid problems, she doubly incontinent, she is wheelchair bound and she needs to be hoisted always as she cannot walk at all she as she can’t use in her legs at all because of accidents she has had at the care home when she could walk. Keep going if you can, Sheila. Wishing you well. I am busy pursuing a retrospective claim for my late mother, who in 2008 suffered a terrible fall that left her totally immobile and requiring 24 hour care. I’ve recently had a response from the CCG stating that DSTs were completed in October 2008 and July 2010 the outcome of which were that she she should receive nursing funding only (Funded Nursing Care – FNC). It was not until 2012 that they found her eligible for Continuing Healthcare. We were told by her doctors when she left hospital in 2008 that she required round the clock care in a specialist residential home and I find it hard to accept the assessments that were then made subsequently. The CCG has recently told us that it can only look at unassessed periods and consequently it will not review the period from 2008-2012. Is this right? Jonny – if the (then) Primary Care Trust failed to inform you that Continuing Healthcare assessments were taking place back then, and/or if they failed to involve you and/or if they failed to provide you with the necessarily information to make an appeal, I would argue these points – because it means they have made previous funding decisions based on flawed process. Ask the CCG for copies if the previous DSTs. If they can’t provide them, it calls into question whether they were actually done. I recently secured funding for my father after 3 attempts. Having read all your articles I went into the last assessment fully armed. I mentioned the Coughlan case and was told that as she did not have a full assessment and was not scored, you could not compare. But of course I was able to challenge this based on all your articles, even reading part of the transcript from her court hearing. I also asked the social worker whether she thought that the local authority could meet my father’s needs and her reply, ‘it is not relevant because he is a self funder’ . However after I pointed out her error that his financial situation was not relevant, she quickly shut up. You must arm yourself with as much case law as possible, so that they know you know what you are talking about. Good advice, June. Thanks for your comment. Myself and my family cannot thank you enough for making available all that we needed to know about CHC in an easy to read and understandable format. Together with information from the wonderful Independent Age website, we have managed to secure a decent and affordable nursing home placement for my grandmother without the need to pay top up fees. We have had a full Continuing Healthcare (CHC) assessment and although my gran did not qualify for full CHC at least we can be satisfied that this process was conducted properly and then reviewed. As many people will have experienced, Social workers don’t explain your rights, so advice like yours is really needed and appreciated. I would everyone to send an email summarising the actions points arising from any CHC review meeting they are present at to all attendees of the meeting. It’s amazing what gets conveniently forgotten about after the meetings if you don’t do this. A MASSIVE thank you to all at Care to be Different. Published information about CHC can be confusing, so I’m really glad that the information we provide is clear. Thanks for your kind feedback, Lisa. I think that’s a great idea to send a summary of action points and notes to everyone involved in the assessment/review process. Before the initial checklist meeting, I contacted all of my Father’s medical professionals (GP, Consultant Physician, Occupational Therapist & District Nurse) to ensure that they were all in agreement that Dad was eligible. I then read the initial Checklist document thoroughly along with information on this web site, and completed it myself and took my version to the initial meeting – arguing every point in Dad’s favour and relying heavily on stating the fact that a well-managed need is still a need. Dad has a 24 hour live-in carer and additional carers 3 times a day. Once through the Checklist, I did the same with the DST document, again using information on this web site and in the NHS National Framework Document, which I now know much better than I ever wanted to. I also wrote a 5 page document giving a brief history of my Father, and detailing all medical issues, with dates, hospital admissions, equipment required and evidence that I felt relevant to each of the domains in the DST. Once I knew the names of the Social Worker and Assessing Nurse, I made sure that they both had a copy before they came to do the assessment. I also sent a copy to Dad’s medical professionals that I had contacted earlier. My reasoning being, that if they had all the relevant information in front of them, they’d find it easier to complete any questions from the CHC team, quickly and accurately. At the Decision Support Tool assessment itself, I remained calm & friendly but discussed each domain thoroughly. A couple got marked down, but a couple also got marked up. Dad was awarded CHC in April 2016, but we’re now discussing the high level care plan that they’ve put together, which in my opinion is missing any night time care. I’m approaching this as a safeguarding issue (picked up from this web site) and have a meeting planned with the Social Worker and Manager to discuss. I’m also disputing the start date of the claim, as they lost the initial CHC checklist for 7 months! And then insisted that we start with a new checklist, despite them having a copy of the original, which recommended a full assessment. So, more paper work and letter writing for me, but there is some light at the end of the tunnel. One of the things that has made my life easier, is the fact that I’ve been keeping a daily diary since September 2013 about all of Mum & Dad’s health issues – so I strongly agree with Angela’s advice to keep notes on everything. Many, many thanks again for such a comprehensive source of information. I’m so glad the website is helpful. Thank you for your very kind words, Elizabeth. It sounds as though you had a good strategy – and I completely agree that keeping detailed notes on everything is invaluable. Good tips. Fantastic article. I would have just ranted and swore a lot. Thank you Chris. I think all of us are tempted to rant at times, given the hurdles that have to be overcome in CHC. Thank you Angela for all the advice and support I received through your organisation. I was successful in securing funding for my father, but could not have done it without access to all the resources available through your excellent website. The best advice I can give is keep a diary of all the care and health issues (falls, not eating, examples of confusion, unsafe situations, infections, comments from health care professionals etc. ) your case is so much stronger if you have evidence and make sure that these are included in the assessment notes. Go into the assessment with evidence against each of the criteria your relative will be assessed against. Do your own research on the drugs and monitoring required. Consult NICE guidelines on treating all conditions (including bedsores) drug regimes (for example steroids affect blood clotting drugs and need careful monitoring giving a higher level of health care need) and make sure you quote NICE guidelines at the review. I cannot overstate the need to take a very detailed approach and be totally prepared. Thank you for your very kind words, Jacqueline. You’ve made some good points, too – it really is vital to be fully prepared and, as you say, the NICE guideline can help too. I have recently won a battle for full funding for my mother, but it has taken a long while She had been receiving full funding for four years but this was then reduced for funded nursing care. Her review was approximately 5 months late and things had changed significantly in that time. I had to go through the Dispute Resolution process, which I followed up with a complaint, based on errors, including the name and address of next of kin, lateness, lack of attendance of Social Care etc!!. The responses to the complaints still contained errors, so I ‘nit-picked’ every detail, and it took four responses. Keep a diary and a chronology and note every detail. Good luck and persevere!! Good advice, Cindy – thanks for your comment. Excellent advice, I am perusing a retrospective claim for my Mum who died in 2013 and just to make it more difficult, I am doing it from South Africa! I was sent care home records last week but interestingly enough the records only went up to Aug 2011!! I pointed this out to them stating that as the review period was 2012 -2013 it was very important that I had the record for that period so that I could compare them to the comments on the DST. Hopefully I will get the records soon, I have just sent a reminder e mail!! Quite right, Jane! Wishing you well with the review. The follow up e mail worked! Sort of, now they sent me the medical records for the period just before Mum died not the daily Care Home records for the review period, so, I have asked again, specifically for the documents that were used to complete the Needs Portrayal and DST so that I could analyse and compare them . Should be interesting!! In addition be prepared to go to next stage, evidencing your information with quotes from the National Guidelines and ask for an independent review (IRP), and then if needed involve the Ombudsman. Hi Cindy and Angela, I see the guidelines were amended in 2013, do they still cover the period between Sept 2012 and May 2013 and if not do you know what does? Look at the National Framework.